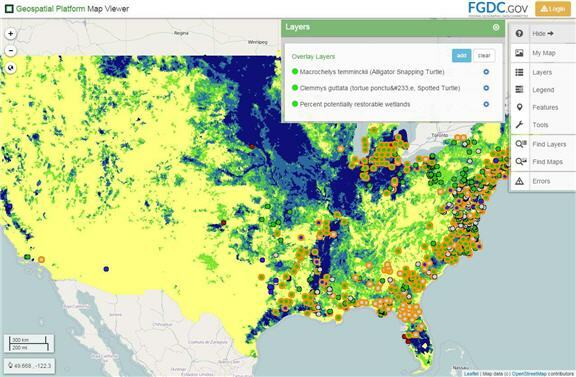 View maps and overlays of spatial data from the EcoINFORMA resource hubs (BISON, EnviroAtlas, and MRLC) and other national environmental data assets related to ecosystems, their living (biotic) and non-living (abiotic) components, and factors that impact ecosystems and biodiversity. The GeoPlatform Web Map Viewer allows users to discover a wide range of spatial layers, create map overlays using remote map services and the user’s own content, and share maps openly for use by other applications and websites. Visit the GeoPlatform to access additional geospatial data, services and applications.